Closing out National Poetry Month with a special postcard I received in the mail this weekend. 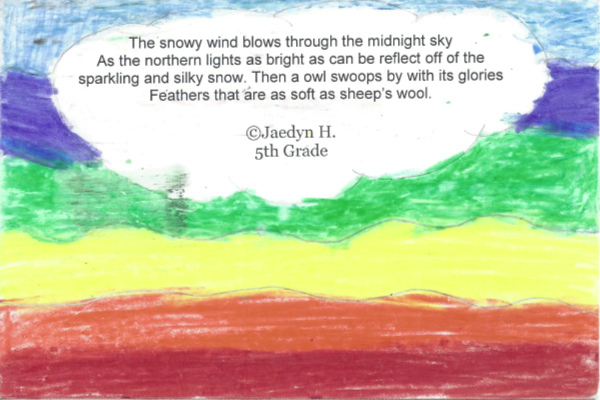 Doesn't Jaedyn paint beautiful imagery with words and imagination? What a talented 5th grader! Thanks to Jone Rush MacCulloch for this wonderful postcard project, and to the students at Silver Star Elementary in Vancouver, WA for sharing their hearts and words. Apparently, I never posted last year's postcard on the blog (?!) . . . The postcard I received in 2016, about sadness, can be found HERE. The postcard I received in 2015, about a preposterous panda, can be found HERE. The one I received in 2014, about a fantastic frog, can be found HERE. sliver of moon and shimmering stars. They marvel at the sight. Click HERE to read this month's interview with Deborah Bruss and Matt Forrest Esenwine. They've challenged us to write a poem about something you would not expect a dinosaur (or another kind of animal) to do. to help you with your packing. Your pants will be all wrinkled. Your shirts will be a mess. © 2018 Cynthia Cotten. All rights reserved. We needed one more player. We’d win this fair and square! He gave that team a scare! With his piercing, no-good glare. We didn’t have a prayer! But he just didn’t care. And sat in coach’s chair. An egg was laid right there! 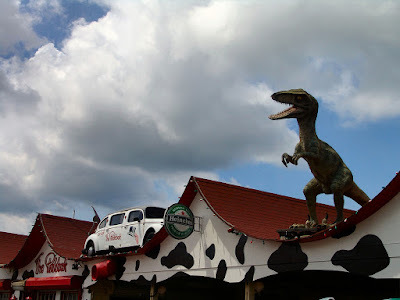 This wasn’t good Sir Dino Mite! She grabbed said egg and chair. Ma Dino to her lair. 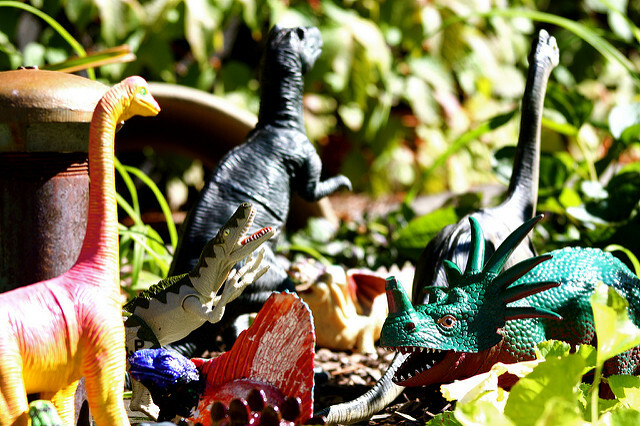 These dinosaur poems about food are like potato chips, you can't stop at just one! Many thanks to all three of these students from Margaret Simon's gifted classroom. hard to imagine one eating broccoli. how that idea is going extinct. You can ask a T.Rex lots of questions. Like why does it eat meat. But never ask why their arms are so short. If you do, when you're running, you'll feel the heat. You can ask why they don't eat plants. 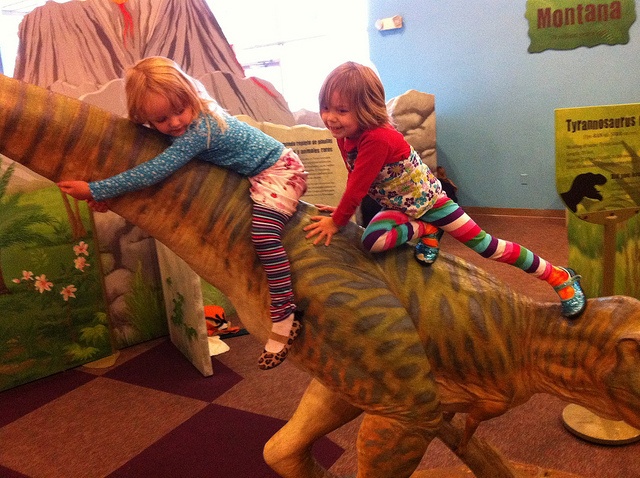 Never say they should go on a diet and eat like a triceratops. If he answers, it will scare your socks off. But that is your loss. His stubby arms won't reach you. 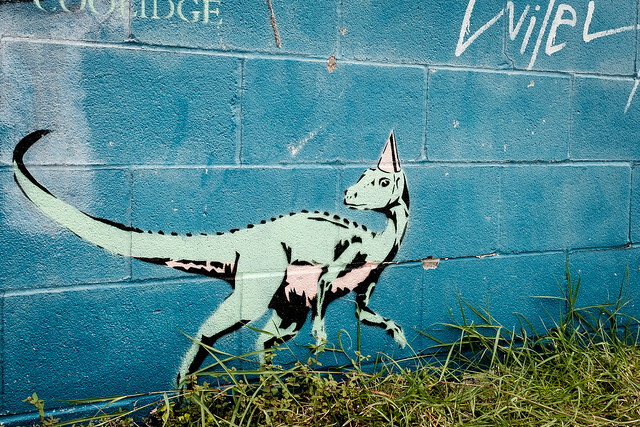 "I gotta get fit, lose the triceratops bacon I ate for breakfast!" AND my wife is going to sign me up for anger management classes." Mrs. Simon's students also wrote a couple of non-food-related poems that you can read on our April 2018 padlet. 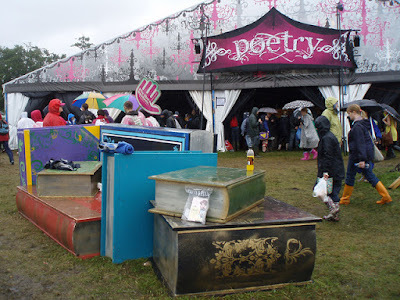 Welcome to the Poetry Tent! B.J. is one of the more prolific "freelance" poets I know, with nearly 100 poems published in magazines and anthologies. What's more impressive is how wide-ranging her work is, and the fact that she chooses to write much of it using traditional poetry forms. If you haven't yet puzzled your way through poetry forms with strict rules about syllable counts, rhyme, meter, and repetition, let me tell you, it's no easy undertaking! B.J. 's craftsmanship is meticulous and exquisite. At one point we shared a poetry critique group (Poets' Garage) and I learned so much from watching her work through revisions. From the outside, it's a bit like magic. 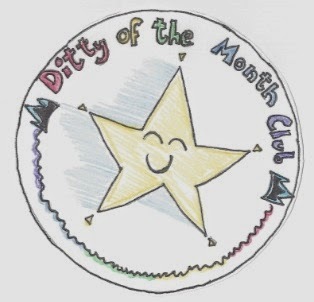 Here at Today's Little Ditty, she's been featured in Limerick Alley and has contributed wonderful poems to Ditty of the Month Club challenges, including a roundel, poems in the style of Marlowe's "The Passionate Shepherd to His Love" and Yeats's "The Lake Isle of Innisfree," and many others. (Read all of her featured poems on Today's Little Ditty HERE.) 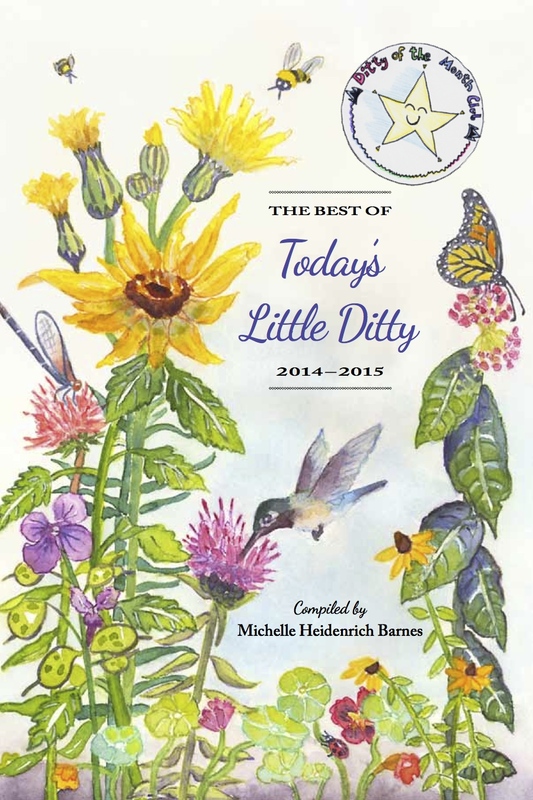 She also has poems in both editions of The Best of Today's Little Ditty, and her debut picture book, There Was an Old Gator Who Swallowed a Moth, arrives from Pelican Publishing next spring. Frankly, I don't know of anyone more qualified to talk about different poetry forms than B.J., so fortunately for us, that's what her TLD contributor posts will be about. She begins today with a look at one of her favorite forms—the roundel. When I first started writing children’s poetry, I used simple rhyming patterns such as ABAB and either ballad meter or a more rollicking anapestic meter. But as time went on, and I encountered poems written in different forms, I was intrigued and wanted to explore them. One of the earlier forms I fell in love with was the roundel. The roundel consists of nine lines, each having the same number of syllables, plus a repetend (refrain) after the third line and after the last line. 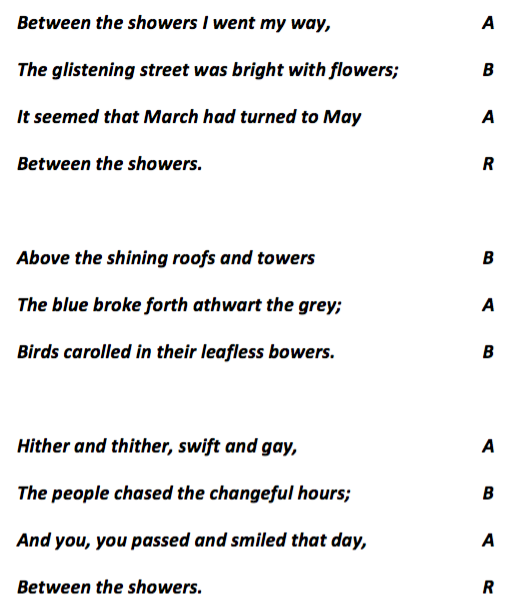 The repetend must be identical with the beginning of the first line: it may be a half line, and should rhyme with the second line. 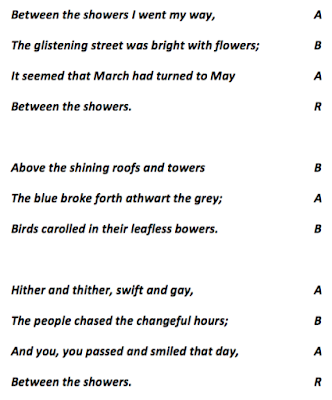 The roundel has three stanzas and its rhyme scheme is as follows: ABAR; BAB; ABAR, where R is the repetend. It sounds more complicated than it is! Algernon Swinburne invented the form in the Victorian era (take a look at his poem "The Roundel" at Poetry Foundation), and Christina Rossetti and others quickly adopted it. Here is an early roundel by Amy Levy, from A London Plane-Tree and Other Verse (1989). I’ve notated the rhyme scheme. Notice the *specialness* of the repetend! A lovely roundel with a sparkly repetend! How did Amy do it? I was determined to find out. I began exploring roundels, reading and writing. One of the first roundels that I ever wrote was a speculative roundel which was published in the dark children’s magazine, edited by agent Bree Ogden, called Underneath the Juniper Tree. © 2011 B. J. Lee. All rights reserved. As published in Underneath the Juniper Tree. With this roundel, I was lucky to hit upon the “aw” rhymes coupled with the “ost” rhymes, which are actually very similar in sound. Notice that the repetend is “catchy,” something I think is critical to the success of a roundel, second only in importance to the theme of your poem. The repetend must be effective. The repetend must also be a phrase that bears repeating. And, it has to end on a good rhyming word, since it is part of the B rhymes. That brings us to the rhymes! You need five A rhymes and five B rhymes (the repetend’s last word + 4 others) for a roundel. My process is to first see if the repetend I have in mind works rhyme-wise, and if not, find an alternate repetend. Your five A rhymes and B rhymes will have to work well together. I look at rhymezone online, and try to loosely see if I can get five A rhymes and five B rhymes that might work, without any forced rhymes, for my particular theme. Once I have five A rhymes and five B rhymes that I think could work, I proceed. It may take several tries with different sets of A and B rhymes. Sometimes a roundel does not work out at all, but usually in the process, I can salvage some kind of poem out of it so the effort is not a complete loss. 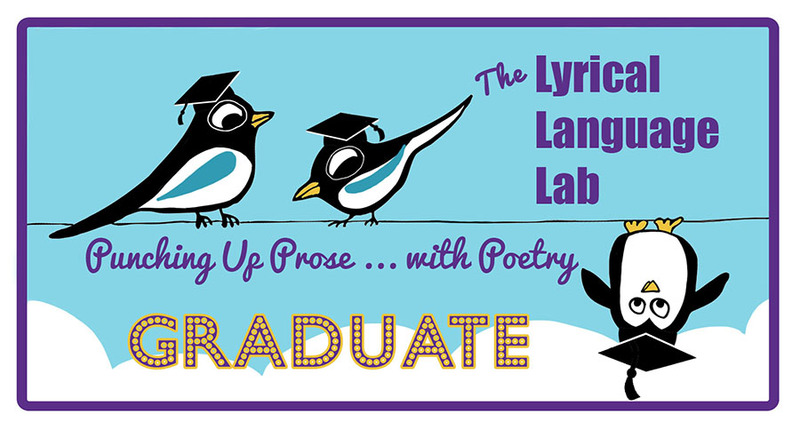 And if it works out, you have a poem in a cool form—a roundel to be proud of! I personally find the roundel to be one of the easiest of the repeating forms, which include the pantoum, villanelle, triolet, rondeau, rondel, sestina and ghazal. Have four solid rhymes, with no forced rhymes. Do you want to try it? Ready? Set! Write a roundel! If you'd like to share a roundel that you've written, please feel free leave it in the comments. Read the roundel B.J. wrote for Rebecca Davis's Kindness Poem challenge HERE. Thank you for this "sparkly" post, B.J., and for taking on this new role at Today's Little Ditty. You make writing roundels look easy! I'm sure I'm not the only one looking forward to learning about other poetry forms in future. The fun is nonstop during National Poetry Month . . .
and so are the giveaways at Today's Little Ditty! Random.org has determined that the winner of a copy of With My Hands: Poems About Making Things by Amy Ludwig VanDerwater, illustrated by Lou Fancher and Steve Johnson is . . . 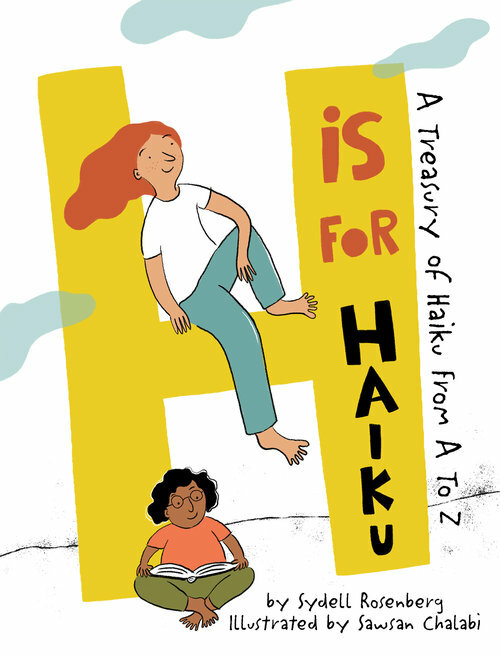 Featured on Today's Little Ditty earlier this week: H is for Haiku: A Treasury of Haiku from A to Z by Sydell Rosenberg, illustrated by Sawsan Chalabi (Penny Candy Books, 2018). Don't miss the special guest post by Amy Losak and giveaway HERE. 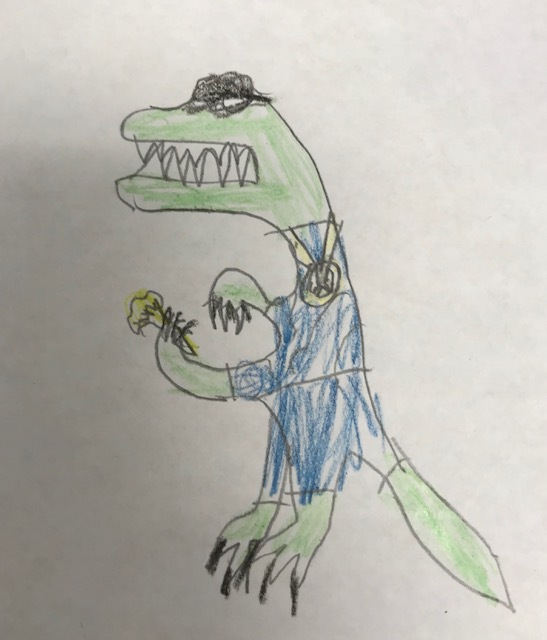 DMC dinosaur poems have been causing quite a ruckus! Featured this week were daily ditties by David McMullin, Jessica Bigi, and Kate O'Neil. Believe it or not, our wrap-up celebration is coming up next Friday, so go ahead and add your poem to the April 2018 padlet before it's too late. 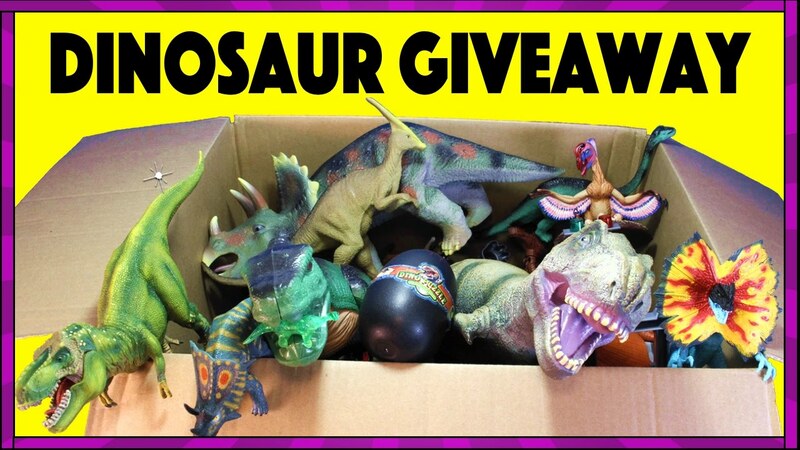 One lucky participant will win a copy of Don't Ask a Dinosaur (POW! Kids, April 2018) signed by Deborah Bruss and Matt Forrest Esenwine. 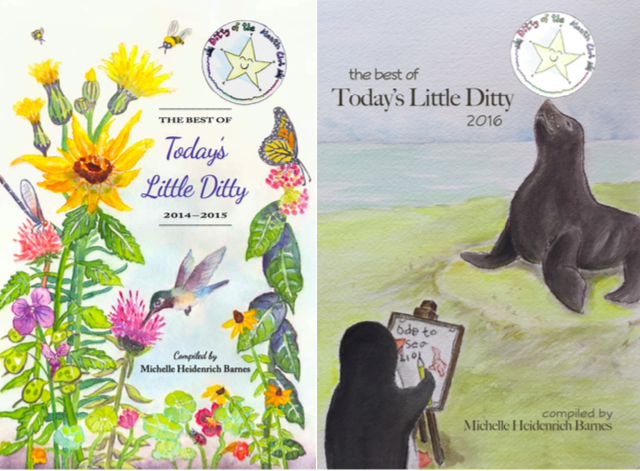 In celebration of TLD's fifth birthday, I'm giving away five sets of The Best of Today's Little Ditty (Vols 1 & 2) to educators—teachers, caregivers, volunteers... anyone who shares their love of poetry with students of any age. To enter, contact me via blog comment, email, Facebook, or Twitter. I'll be compiling a list and drawing names at the end of April. Now head on over to The Opposite of Indifference where Tabatha Yeatts is also celebrating a birthday—it's a new anthology! I'm honored and excited to have three poems in Imperfect: poems about mistakes: an anthology for middle schoolers. And wouldn't you know, she's also hosting this week's Poetry Friday roundup. Score! Oh no! I can't believe it. I'm not in any books. to see how Earth would change. but there's no sign of me. the dinos all died out. But who am I? What does it mean? I think, yet I'm in doubt. My world has crumbled round me. © 2018 Kate O'Neil. All rights reserved. © 2018 Jessica Bigi. All rights reserved. It's been far too long since we last visited the Haiku Garden at Today's Little Ditty. Seeing that today is International Haiku Poetry Day, we're going to remedy that! 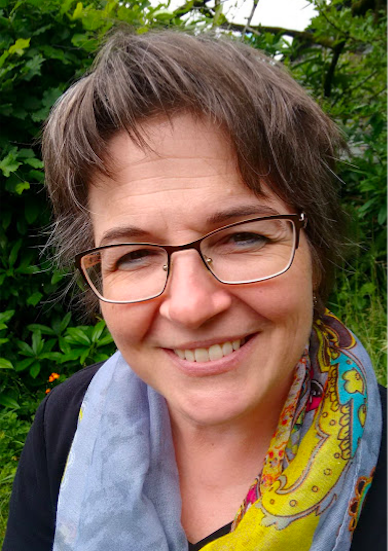 I'm delighted to welcome Amy Losak for a very special guest post. Amy Losak is a full time public relations professional with a spare time passion for writing short-form poetry, especially haiku and senryu. She has been published in numerous haiku journals, and you can also read a sampling of her work online (here and here). Today, however, she will not be sharing her own work. She's here to share the poetry of her mother, Sydell Rosenberg (1929-1996). Amy has spent the last several years on a personal mission to organize and assemble her mother's work into a picture book for children—something her mother always dreamed of doing. Those efforts to revive and preserve her mother's literary legacy have finally been realized in H IS FOR HAIKU: A TREASURY OF HAIKU FROM A TO Z, published this month by Penny Candy Books with amusing and lively illustrations by Sawsan Chalabi. I'm going to hand this space over to Amy now to fill us in. I’ve been writing haiku and senryu for a few years now. I should have started learning about these poetic forms years ago. 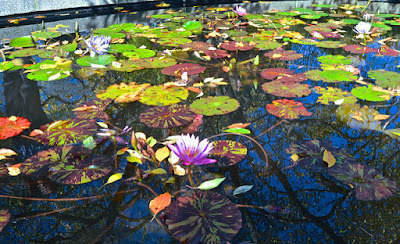 I had a wonderful haijin – haiku poet – in my life, who could have taught and guided me. We could have learned together. Perhaps we would have collaborated. 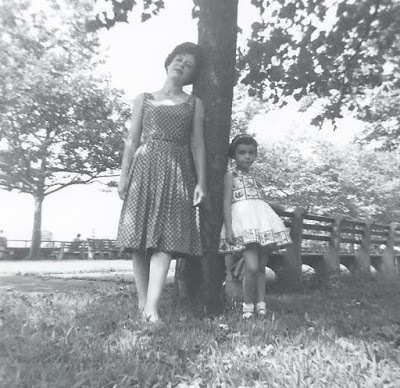 That haiku poet was my mother, Sydell Rosenberg, a teacher and writer. Syd was a charter member of the Haiku Society of America in New York City in 1968, and also served as HSA secretary in 1975. She published her first haiku in 1967, I believe in a journal entitled American Haiku. She wrote and published her short poems (and other poetry besides, as well as short stories, literary and word puzzles; and more) over a roughly thirty-year span (but she had been writing since childhood). And she studied these forms quite seriously. I remember that she studied Japanese in order to try to read the original masters. 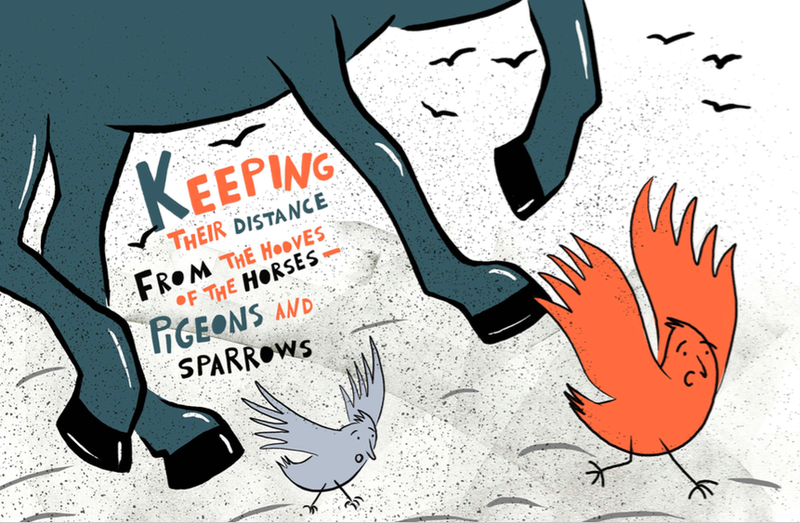 From H is for Haiku by Sydell Rosenberg, illustrated by Sawsan Cholabi. a lot are populated with pigeons, sparrows and squirrels, for example! But they also have an appealing air of timelessness and universality. When I was a young woman, mom tried to engage me in her work. With her encouragement, I even wrote a haiku or two myself as a child (one was about a frightened chipmunk, if I remember correctly), but overall, I was mostly disinterested. She would ask for my feedback. Regrettably, I wasn’t very responsive. I don’t even recall if the poems she wanted me to read were drafts or finished. But mom and her “haiku mind”—her way of seeing a kind of magic in the stuff of daily life—must have exerted a subtle influence on me that I didn’t realize or understand at the time. I know that, among other literary goals, mom wanted to publish a children’s book, preferably a haiku alphabet reader. 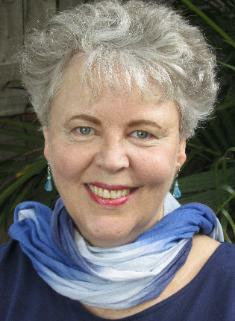 She started submitting at least one manuscript in the 1980s, perhaps earlier, to publishers. After mom died in 1996, her family decided to pick up and fulfill her dream. This didn’t happen right away. I wasn’t ready. But slowly, I began to mobilize. And as I sorted through vast piles of Syd’s papers and other materials and reacquainted myself with her poetry, almost naturally, I started to write haiku and senryu of my own. I also started to read the work of terrific haijin from around the world (thanks to the connectivity of social media). My poems were terrible! However, her influence finally became clear. I even joined the Haiku Society of America (which turns 50 this year) and found the Haiku Foundation to be another great resource. H is for Haiku: A Treasury of Haiku from A to Z has been a long journey filled with both joy and pain. This book is about the “bigness” in the so-called “small moments” we may be too busy or distracted to notice. 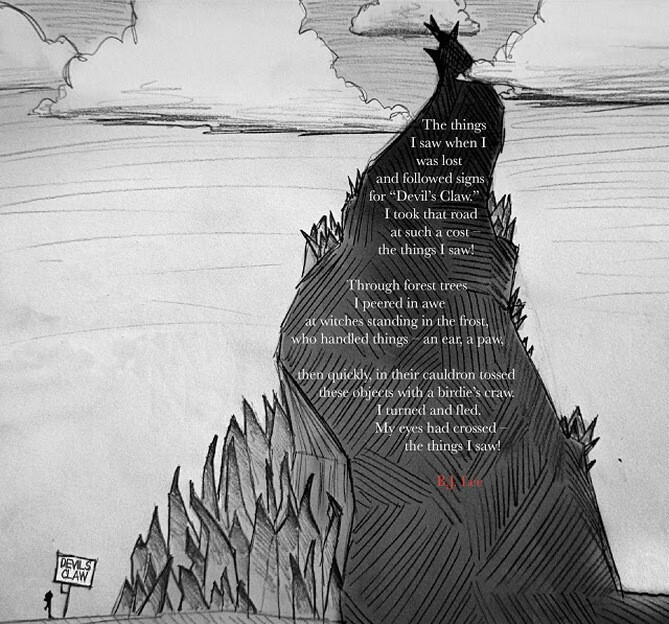 The poems are word-pictures or tiny stories, some of them infused with gentle humor. Everyone will, I hope, relate to them. 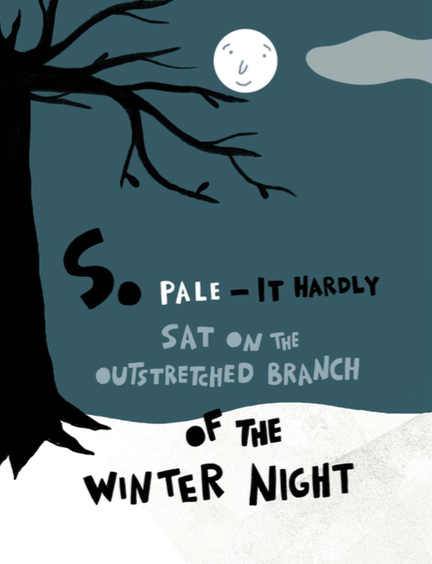 “So pale” was published in haiku journals three times: in 1968 and in 1975 in Haiku West; and in the December, 1996 issue of Frogpond, the journal of HSA, on mom’s memorial page. Over time, I have warmed to the lightness of this poem. It has a subtle sense of serenity, of mystery. I especially like that mom doesn’t specify what “it” is—she leaves this for the reader. In the book, Sawsan interprets “it” as a friendly moon. But “it” can be almost anything the reader wants to imagine. From H is for Haiku by Sydell Rosenberg, illustrated by Sawsan Cholabi, used with permission. I will always be new to haiku, and that’s fine. I am taking my time as I cultivate my own “haiku mind,” my own “eye” and “voice.” I hope to keep improving as a poet, because this is the best way I can think of to honor Syd’s loving influence, and continue to be the steward of her legacy. It’s also a lovely way for me to slow down my often frantic pace and find bits of magic in my daily life. I hope readers will be inspired to haiku, too. Thank you for sharing your journey with us, Amy, and your mother's exceptional work. You must be so proud of what you've accomplished, and we all are better off for you having done so. Sneak a few more peeks at H is for Haiku at the blogs of Sylvia Vardell, Robyn Hood Black, and Matt Forrest Esenwine; and many thanks to Penny Candy Books for offering a copy to one lucky reader! Leave a comment below for a chance to win a copy of H is for Haiku: A Treasury of Haiku from A to Z courtesy of Penny Candy Books. 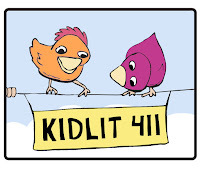 Alternatively, you may send an email to TodaysLittleDitty (at) gmail (dot) com with the subject "H is for Haiku giveaway." Entries must be received by Wednesday, April 25, 2018. The winner will be selected randomly and announced on Friday, April 27th. 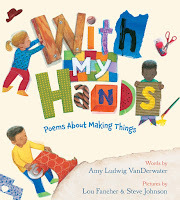 Tomorrow (Wednesday, April 18th) is the last day to enter the giveaway for Amy Ludwig VanDerwater's latest collection of poems for young readers, With My Hands: Poems About Making Things, courtesy of Clarion Books/HMH. Read the post and giveaway details HERE. 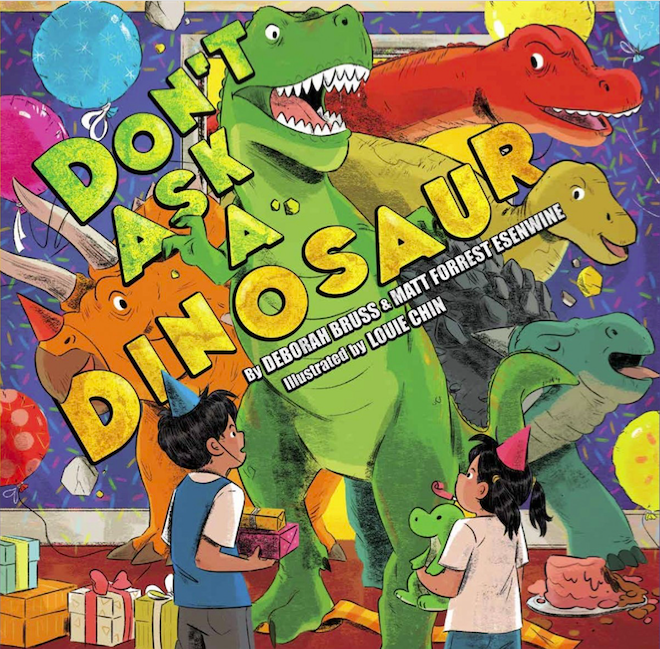 Besides being International Haiku Poetry Day, today is also the official book birthday of Deborah Bruss and Matt Forrest Esenwine's Don't Ask a Dinosaur (POW! Kids). Yes, we've got a giveaway for that one too! Read about our month-long celebration HERE. and how these things are used. upon them all the time. in memes, and texts, and apps. mammoth fingers just can't solve. 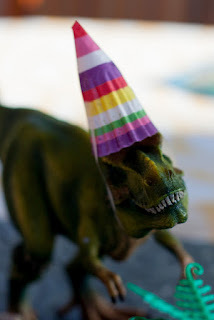 A little dino told me Today's Little Ditty is not the ONLY one celebrating a birthday this month. This one's for you . . .
he always takes the lead. or even to slow down. we all should eat much more! I hope Deborah Bruss and Matt Forrest Esenwine don't mind me writing about an imaginary dinosaur rather than a real one, but I couldn't resist the opportunity! If you missed last week's interview, you can find it HERE. Their challenge this month is to write a poem about something you would not expect (or want) a dinosaur, or other animal, to do. 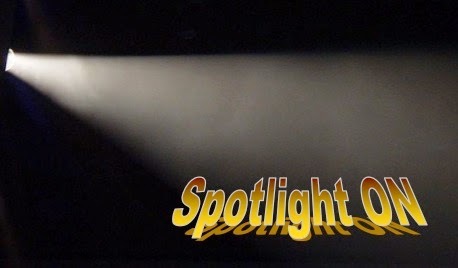 Read my Spotlight ON interview with Lee Bennett Hopkins HERE. If you're looking for collections of dinosaur poems, these three LBH editions are a great place to start... although I don't recommend swallowing them whole. It's giveaway central around here this month! This week's "dino-ditties" were by Matt Forrest Esenwine, Linda Baie, and Kathleen Mazurowski. Leave yours on our April 2018 padlet. While some contributions will be featured as daily ditties, they all will be included in a wrap-up celebration on Friday, April 27th, and one lucky participant will win a copy of Don't Ask a Dinosaur (POW! Kids, April 2018) signed by the authors. 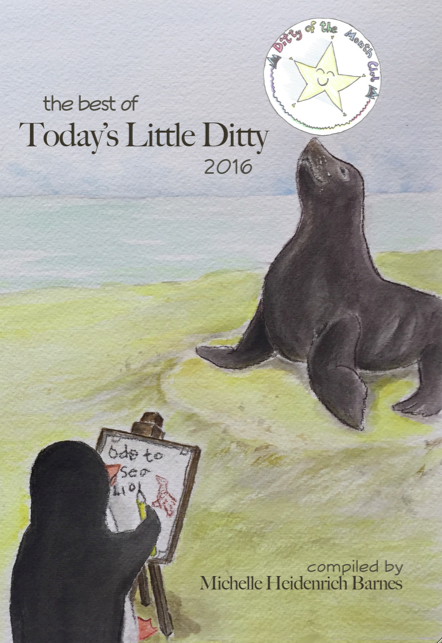 To celebrate TLD's fifth birthday, I'm giving away five sets of The Best of Today's Little Ditty (Volumes 1 & 2) to educators—teachers, caregivers, volunteers... anyone who shares their love of poetry with students of any age. To enter, contact me anytime during the month—via blog comment, email, Facebook, or Twitter. I'll be compiling a list and drawing names at the end of April. Robyn Hood Black has a whole lot more surprise party fun at Life on the Deckle Edge. Join her for this week's Poetry Friday roundup! 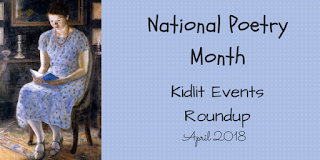 For more National Poetry Month projects taking place during April, visit the kidlit events roundup at Jama's Alphabet Soup.